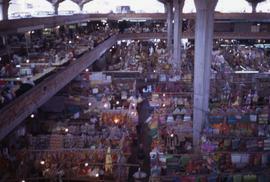 Colour Kodachrome 35mm slide depicts a market in the interior of a building. Colour Kodachrome 35mm slide depicts the square in the centre of a white and brick building which has colouful awnings on the portion of the building which is on the left side of the image. Colour Kodachrome 35mm slide depicts a street with several people including a cyclist and square with a fountain and the Cathedral of Morelia in the background. There is a carriage in the street on the left of the image. Colour Kodachrome 35mm slide depicts Phyliss posing in front of the Cathedral of Morelia. Colour Kodachrome 35mm slide depicts people standing around rows of different bowls for sale lined up on the ground. Colour Kodachrome 35mm slide depicts piles of clothing lined up along a wall and Phyliss Snider posing on the right of the image. There is also an unknown man standing by the clothes and another man with his back to the camera carrying wooden rods. Colour Kodachrome 35mm slide depicts a cement fountain that is spraying water into the air. Colour Kodachrome 35mm slide depicts two stories with archways and a mural painted on the wall of the second story. Colour Kodachrome 35mm slide depicts people standing around clothes which are draped on a platform with piles of clothing in the foreground.